Shut Up Legs! : Born To Rhone...Stage 8: Vienne to Carpentras. 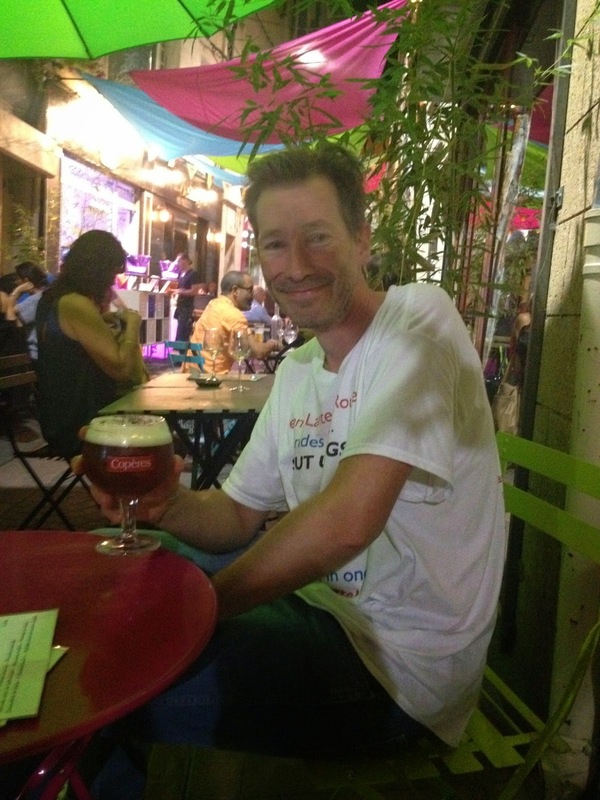 Born To Rhone...Stage 8: Vienne to Carpentras. Awful pun redeemed by a barstorming tune! There were a few contendahs for today's theme but The Boss won out in the end...especially since I spent a fair chunk of time paralleling the great river heading south. Right then, you'll know that yesterday's jaunt was a bit on the extreme side, so it was to be expected that I'd have a slightly later start which in turn guarantees a later finish. Didn't realise quite how late, hah-hah! There was a McDonalds around the corner from my Formule 1 dump of a hotel, so this was my intended breakfast stop. Great idea until you realised that they didn't open until 0900. Best they could offer was an orange juice. In 23 minutes. No dramas as there was a handy gasoline/boulangerie stop after that *expletive deleted* climb. What wasn't quite so handy was the realisation that the wind was going to be against me. All day. Still, it was only reaching 28c so why the kvetching? Come rain or shine...you got the wine! You always keep an eye on the clock, not last because this lets you know when you may expect to have a pint...although this has been the driest Le Tour by some margin. Ouch! The mighty Rhone. Some pretty villages along it...wish I could've tarried a'while. Not dissin' Moto or whatnot, but our services leave a little to be desired. Just. Too. Easy. But still worthwhile. Bell-end. ...go for the long one? I decided to gamble and go for Carpentras despite the fact that it was gone 6pm and that home was 40 miles away, still with the wind and heat. Stubborn/ tight/ stupid. Still not sure! Oh come on, give it some Dolly! "Bollene, Bollene...Bo-llene!" Mofo was against me almost all of the way. When the 100 miles mark came up it was a cause for minor celebration: this was probably the hardest one that I've done. Some daft satisfaction in that, hah-hah! Yes! There he is...the big guy in the distance. I did shout! Was cooling rapidly to 30c. Second layer needed? Non. We'll wing the last 10 miles...go, go, go! I was so slow that that I had to complete the day in twilight, but I took cycle paths and pavements so stayed out of the way. After abbreviated admin I legged it out to find hot food and cold beer: got 50% right with a tapas bar that were happy to serve. Cheers! Sort that posture out. Top, cold brew! Safe to say that that was the hardest century that I've done. A walk in the park however compared to what some people are going through. It also puts an end to part one of this challenge- and it has been exactly that, no minor trundle just to get donations going. To those that have donated, thank you! CLICK HERE FOR VERRRRRRRRY LONG MAPS'N'STATS! If you've read this far then you deserve a reward...here is Dion still loving that belting song!